Thoracic aortic aneurysms (TAAs) and ruptures are less common than abdominal aortic aneurysms accounting for 25% of all aneurysms.,, TAAs are more common in males with a male to female ratio of 1.7–3:1 and a mean age of 65 years at presentation.,, The incidence of TAAs is estimated to be 5.9 compared with 350 cases for abdominal aortic aneurysms per 100,000 person-years. Of the TAAs, the ascending aorta is affected in 50% of cases; the aortic arch in 10% and the descending thoracic aorta (DTA) in 40%. Rupture of an aortic aneurysm has a high mortality even with prompt treatment only 10%–25% of patients survive. Globally, mortality figures from aortic aneurysms have risen from approximately 100,000 in 1990–152,000 in 2013. We report a 79-year-old male patient who was a known hypertensive for several years but has not been compliant with prescribed medications. He was also on medications for peptic ulcer diseases diagnosed years earlier. He presented a day before demise with a 4 h history of severe epigastric pain. He was managed for acute exacerbation of peptic ulcer disease to rule out pancreatitis and was subsequently placed on intravenous fluids, antibiotics, and antiulcer medications. Results of hematological and serological investigations were within normal limits. Eighteen hours later, his clinical condition deteriorated rapidly and he had a cardiopulmonary arrest and was confirmed dead. At autopsy, general examination revealed only severe pallor. The thoracic cavity, however, revealed 3,300 ml of left hemothorax with collapse of the left lung and bulging left pleura [Figure 1] and [Figure 2]. There was a 6-cm aneurysmal dilatation of the DTA with a 4 cm × 2 cm tear/rupture [Figure 3] in the wall of the aneurysmal sac. Atheromatous plaques and extensive intimal hemorrhage were also seen. Microscopic examination confirmed complicated atherosclerosis in the DTA. Hypovolemic shock from massive hemothorax due to rupture of a descending TAA was implicated as the cause of death. A high index of suspicion is needed in diagnosing aortic aneurysm due to its ability to mimic other more common conditions as was seen in this case., The disease has been dubbed “a silent killer” due to the fact that only about 5% present with symptoms while 95% of emergency patient with aortic aneurysm were previously asymptomatic. The previous history of peptic ulcer disease had totally masked any suspicion of an aortic aneurysm. 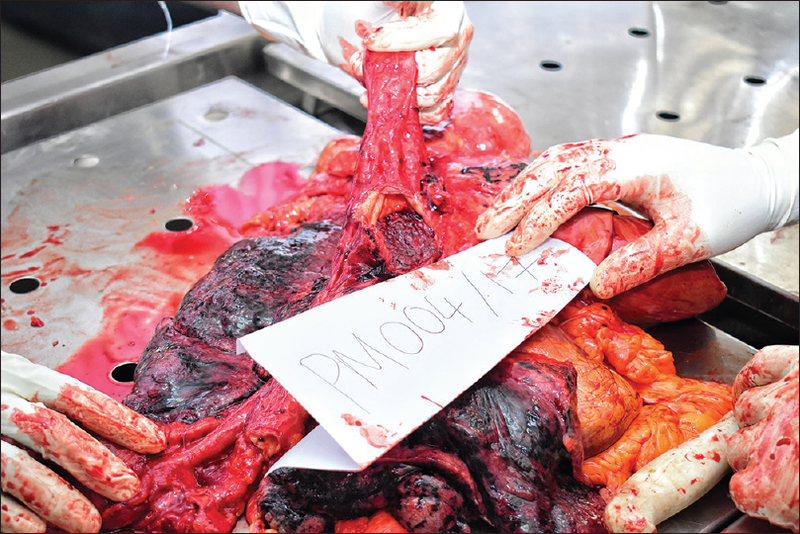 The lack of evidence of peptic ulcer in the stomach at autopsy suggests that the epigastric pain may be due to the weakening aneurysmal sac. Cystic medial degeneration, usually due to aging, has been implicated as the main cause of aortic dissection and aneurysm in the ascending part of the thoracic aorta while atherosclerosis is the most common cause in the descending part of the thoracic aorta. This is due to the weakening of the tunica media by deposition of atherosclerotic plaques causing derangement of layers of elastic fibers and smooth muscle cells as was seen in the index patient with complicated atherosclerosis. Although many connective tissue diseases, such as Marfan and Ehlers–Danlos syndrome, are known causes of aortic aneurysm, familial clustering of diseases have also been reported with several genes which code for fibrillin being implicated particularly MYH11 and ACTA2. The silent nature of the disease stresses the importance of doing appropriate examinations and tests in the elderly and in patients with family history of the disease. Despite the high fatality rate in the event of a rupture, the disease is curable using surgical and medical therapy if discovered early. Typically, most aneurysms are treated surgically when the diameter of aneurysmal sac exceeds 5 cm., Medical treatment is usually instituted before the aneurysm getting to the critical value. The aneurysmal sac in our index patient was 6 cm which indicates that the aneurysm had gone beyond the critical value and was already a candidate for a catastrophic event as at the time of presentation. Over 50% of aortic aneurysms are undetected before death which suggests that the actual incidence of this disease is not truly known. The autopsy that was done in the index patient was key to arriving at the definitive cause of death. The importance of autopsy is further illustrated by this case and will again remind the medical community about the need to be aware of a “silent killer” and take appropriate preventive measures in their patients. 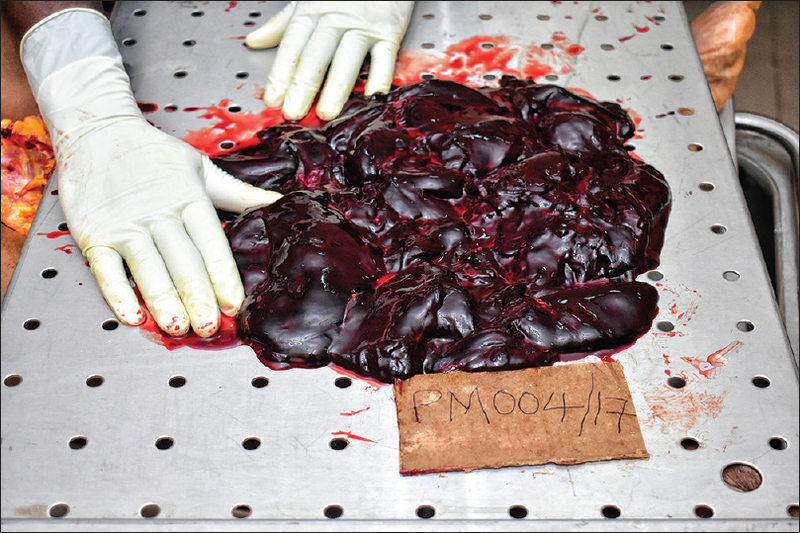 The findings at the autopsy of this index patient is a reminder of the postmortem examination in determining the cause of death and thus making us have a true incidence of many “Silent killers” such as aortic aneurysms which are underreported. There is a need to look out for this disease in susceptible patient populations. Johnston KW, Rutherford RB, Tilson MD, Shah DM, Hollier L, Stanley JC, et al. Suggested standards for reporting on arterial aneurysms. Subcommittee on reporting standards for arterial aneurysms, ad hoc committee on reporting standards, society for vascular surgery and North American chapter, international society for cardiovascular surgery. J Vasc Surg 1991;13:452-8. Evangelista A. Aneurysm of the ascending aorta. Heart 2010;96:e979-85. Pomianowski P, Elefteriades JA. The genetics and genomics of thoracic aortic disease. Ann Cardiothorac Surg 2013;2:271-9. Kent KC. Clinical practice. Abdominal aortic aneurysms. N Engl J Med 2014;371:2101-8. Hannuksela M, Stattin EL, Johansson B, Carlberg B. Screening for familial thoracic aortic aneurysms with aortic imaging does not detect all potential carriers of the disease. Aorta (Stamford) 2015;3:1-8. Upchurch GR Jr., Schaub TA. Abdominal aortic aneurysm. Am Fam Physician 2006;73:1198-204. Canon C. Radiology. McGraw-Hill Speciality Board Review. New York City: McGraw-Hill Education; 2009. Dăhnert W. Radiology Review Manual. 7th ed. Philadelphia: Williams and Wilkins, Lippincortt; 2011. Adekanmi AJ, Olusunmade D. Giant ascending aortic aneurysm: Are there peculiarities in the developing world? Open J Clin Diagn 2014;4:105-11. Bickerstaff LK, Pairolero PC, Hollier LH, Melton LJ, Van Peenen HJ, Cherry KJ, et al. Thoracic aortic aneurysms: A population-based study. Surgery 1982;92:1103-8. Behera C, Ravi R, Lalwani S, Dogra TD. Sudden death due to aortic rupture while swimming – A case report. J Indian Acad Forensic Med 2008;30:79-81. 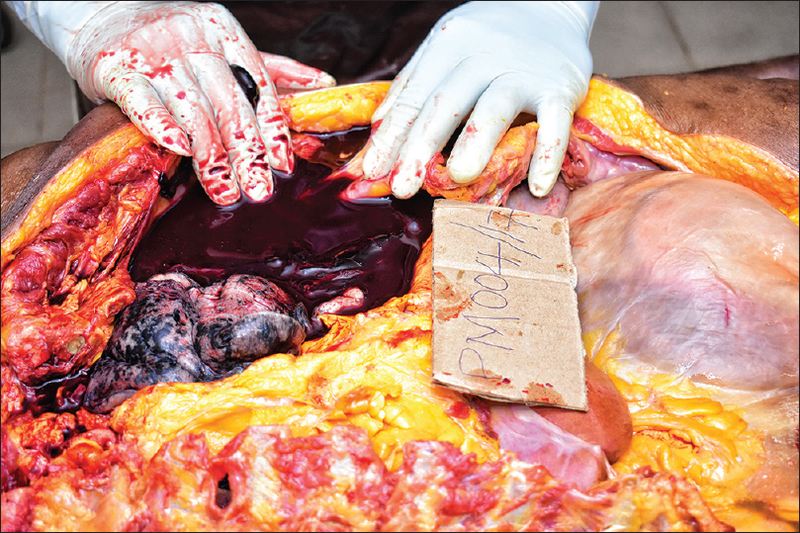 Pannag SK, Sapeco SD, Wiseman Pinto RG, Couto F. Fatal traumatic rupture of ascending aortic aneurysm having idiopathic cystic medial necrosis: An autopsy case. Indian Acad Forensic Med 2010;32:339-42. Verma S, Sheikh WR, Jaiswal S. An atypicaal presentation of acute aortic dissection in the emergency department. J Case Rep 2017;7:177-9. Prakash P, Patni R, Asghar NM, Chan KM, Antanas M. Ascending aortic aneurysms: Pathophysiology and indication for surgery. E J Eur Soc Cardiol Counc Cardiol 2011;10:1-4. Lavall D, Schäfers HJ, Böhm M, Laufs U. Aneurysms of the ascending aorta. Dtsch Arztebl Int 2012;109:227-33. Elefteriades JA, Sang A, Kuzmik G, Hornick M. Guilt by association: Paradigm for detecting a silent killer (thoracic aortic aneurysm). Open Heart 2015;2:e000169.